Piano Slam 8 - Complete Performance. 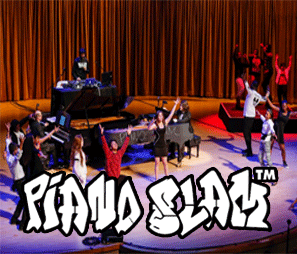 This video is the entire Piano Slam 8 show on April 13, 2016 at the Adrienne Arsht Center for the Performing Arts in Miami. Pianists Maarten Van Veen and Bobby Mitchell were joined by DJ Brimston 127, poet Denice Frohman and dancers choreographed by Hattie Mae Williams as they performed in ensemble with the finalists of Dranoff's Piano Slam 8 poetry competition: middle and high school students of the Miami Dade County Public Schools. Creator and Producer: Carlene Sawyer. Music Director: Erik Ochsner. Director: Teo Castellanos.